One day as a man was walking alone he met a coyote. Coyote spoke to the man and said, "How would you like to smoke my pipe?" The man thanked the coyote and said "Sure!" When the man was finished, the coyote said to him, "You have smoked my pipe so now you are my friend and I will not harm you, but will take you to meet my people. I want my people to know that you have smoked my pipe. They will be glad to see you and will give you great powers." They walked on a way and after a while they met many coyotes and wolves. When the coyotes and the wolves saw the coyote with the man one wolf called to the other wolves and said, "Everyone be seated. Let us hear what these people who are coming have to say." When they were seated the coyote stood up and said, "This man is my brother. He smoked my pipe. He came with me to pay you a visit. Let us take pity on him and make him a wonderful man." The man was frightened, for the wolves came very close to him. Then the man was told that he must not be afraid to look. So he did and saw many coyotes, old and young. The coyotes began to roll in the dust then they came to the man and gave him plant roots and told him that the roots were good for healing the sick. Then one of the coyotes arose and said, "We will give you this root and if any many is bitten by a mad dog give him this medicine. He will then get well and not go mad. The other medicinal roots are good for other ailments and pains." Next a wolf stood up and rolled in the dust. Then he arose and gave the man a whistle and said, "I give you the whistle. When anybody is sick, use this whistle and the person will be made well." Then another wolf arose and gave the man a piece of bone with the skull of a wolf on it and said, "Take this piece of bone. If anyone attempts to poison or bewitch you, lay the bone on your forehead and you will be able to overcome them. My power is the bone." Finally the man spoke and said, "This is enough. I thank you wolves and coyotes, I am glad I cam here." Then coyote took the man back to the village. "When you get home," the coyote said, "take this whistle. Blow it before you get home. Blow hard and we will hear it; all the coyotes and wolves will hear it." The man did as he was told and heard the coyotes and wolves howl in the distance. After several days he heard of a man who was very ill. He went to him and doctored him. 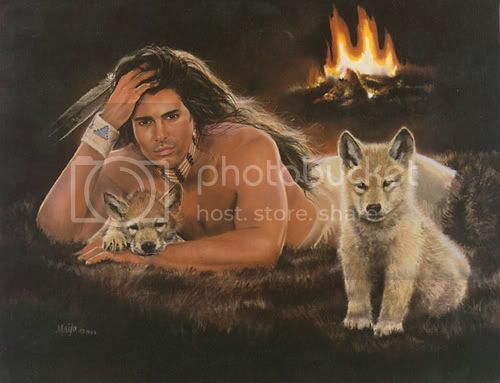 With the new healing powers he had learned from the wolves and the coyotes, he was able to cure the sick man. The Power of INTENTION, strong as any Medicine! How beautiful, If man had not had faith and belief, he would never of made any attempt. in rememberance of the times human and animals walked really together and we were able to learn from them. why did we forgot? why did we break the bound? well, isn't it time to pick up the old agreement between humans and animals and start to learn again from them? and maybe that's why I was born here. to make men aware of this bound again, and also the rest of nature that lingers here, make them feel that there are still humans that are wanting to learn and listen. and when the wolves come I will roll in the dust with them. I carry this story within me. It is good you share this. Do you remember what tribe told this story? Wow What a beautiful story. Thank you so much for sharing. The near death experience accounts that people, especially children give about meeting deceased pets during a brush with death imply that there is more to this story than we might at first imagine!! I read my ten year old daughter every one of these accounts. She loved them!! !